Traditionally, the eldest son offers the cremation ashes to a holy river. “He is everyone’s Dad,” Sanjay-bhai (his eldest son) declared. Hence, in an absolutely unprecedented move of decentralization, a bus-load of 70 people carried his final rites to the Narmada river. Ishwar-kaka would sometimes say, “You clean the outside world as a way to clean your mind.” In place of rituals, all seventy of us took our brooms to clean up the filthy river banks. For a man whose words could probably never due true justice this post is an incredibly beautiful tribute to the great man that Ishwar-kaka is (not was because his spirit lives strong in all of us that know him). If we could all live even a fraction of the life that Ishwar Kaka led, just imagine the the positive impact it would have on this world. Thank you for sharing. Jai Sita Rama Laksman Hanuman! Jai Jalaram! For those of us who wished to be there, this transportation is a consolation. Thank you Nipun..
nipunbhai - beautiful words describing a beautiful person. Dear Nipun - It is difficult to express in words the sorrow I feel at Ishwarkaka's passing away. Thank you for bringing to us so vividly his last moments. My utterly humble pranaam to kaka for living a life so pure and so selfless. Ishwarkaka (true to his name) remains a divine presence in our life even after his bodily separation. Our greatest tribute to him would be in helping his efforts continue, in whatever way shape or form. Jai Jalaram. It is times like this that I am deeply thankful to have been touched by Ishwardada, Jayeshbhai and the entire Manav Sadhna family. No words describe the daily impact he - and often through the others as well - has. While Ishwardada will be missed, there is no doubt he says with us in so many ways. Thank you Nipun for being a connector in these stories. Nipun, thanks for sharing this. Moved beyond words. What a true Yogi he was. I came to know him through your loving words about him, Nipun, having never met him. His gentleness, understanding, and service to others are an inspiration to us all. Thank you. Nipun, thank you for sharing this! Wow! - what a practice of detachment! - "In a young coconut, its shell and its inner substance are intertwined and can't be separated. In a ripe coconut, they can be easily separated. So I'm like a ripe coconut. My mind is separate from the body." Deeply moving, thank you Nipun for being the connecting thread. 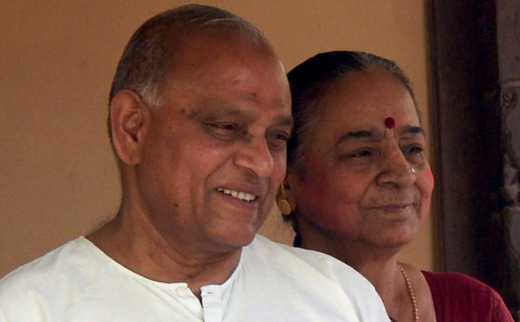 May Ishwardada's soul rest peace and tranquility. I am deeply touched and inspired by reading this moving and uplifting real life and death story. I had the privilege of meeting Ishwarkaka and Jayeshbahi in Gandhi Ashram three years ago when I was in Ahmedabad. I instantly felt the presence of Gandhiji's spirit in both of them. It was indeed a pilgrimage. Aum: Shanti,Shanti, Shanti. Such an inspiring soul with a compassionate smile. to cleanse the world. Thanks for this touching write-up. May Ishwarkaka send more souls like him to this earth...Long Live Ishwarkaka.. Thank you so much for writing about Ishwar Kaka.His life will inspire millions of people in the future also.People should write more about these great people. Thanks for a cute write up Nipun. what an inspiring man he was. I have linked this in my blog. O! God! Please continue to send such divinely examples to earth to guide us and motivate us. I happened upon your site whilst reading about Vimalatai.Since then I have been ever grateful to you and this site for the exemplary articles posted and reached to us. Thank you again for introducing Ishwarbhai and his ilk to us. Thank you for the beautiful homage. It helps and inspires my soul tremendously to read about someone such as Ishwar Patel. The picture of Ishwar Kaka speak a thousand word. Jayesh Bhai and Anar Ben Simple living and grander of the peacock is what reminds me of Kaka. He told Prashant the first day you can live here. PATANG is a tribute to him and all of you. May all of us live in giving love and joy by changing each other to share and work with a devotion-no expectations except do what one can do best. At the screening in AHMEDABAD thats what I embraced when I hugged you. Jai Shri Krishna, Jay jaymal Prashant devotes his life like you and so many others. I never comment! I felt I needed to here. After reading about this guy I felt a new hope rising in me. I wonder what I will do with it! Really very touching. Words don't justify it fully but speaks a lot about such a wonderful person and his thoughts. Incredible story. I wish I could emulate even a samll part of his life as a homage to him. Such a moving post, Nipun. And so inspiring a man. May his soul rest in peace and his spirit live on. Nipun, what a beautiful way to say goodbye to a great soul and yet keeping him alive in your reader's heart.Beautiful. Thank you, Nipum, for sharing such noble person. Nipun - thanks for sharing this! Very inspiring. A superb soul. May there be many more born of like inspiration! I met Ishwar Kaka several times surfing my 7 years stay in Ahmedabad and one thing which I can say blindly that "I have never met a person like him in my life till now! And every time, I used to meet him - there will be new spirit within him to work for people"
Thanks Nipun bhai sharing his story with the world. Nipun, I have never written to you, but how can I not do so now -- after your profoundly moving words about Ishwar Patel. Such stories change our lives. Ishwar Dada is no doubt a great man! Some one like me who know very little about him can feel the intensity of his karma. He brought a difference, a positive change to the people's life connected with him. That is what I learnt from him...be the change you wish to see in the world. On the day we (me & my husband)learnt about his death...we decided to try to imitate his action in some way...we decide to sponsor the education of my maid...she is so happy...it gives me immense satisfaction...I can imagine the amount of satisfaction Ishwar dada had from his journey of life through his action. I sense his smile from heaven when I acted upon my wish of educating my maid in due respect for him.Ishwar Dada lives in our heart. Ishwarkaka was a living legend. let us all learn to live life him even in a small way. It will make this world a better place to live in. Thanks, Nipun, for this lovely, inspiring article. No words could ever express how much he lives not how he died. We will remember him simply as Gods precious work of art. Just do what he said "bloom wherever you're planted and keep serving through small act's of love" Create heaven wherever you are. May Ishwar Patel's soul rest in peace. A glorious example of "Nishkam Karma"
A service to Humanity is THE service to God. Our Pranam to such an enlightened SOUL. Thank you Nipunbhai for so eloquently sharing Ishwar-kaka's life with us. May his soul rest in peace and the work he started stand for a long time as a testament of his wonderful life. Truly a moving account. Ishwarkakas don't die. They remain alive in their works, and inspire us. A great man, an awesome example of humanity at it's best. Half way around the world, I am grateful to hear of his service. Ishwar Patel inspires us all. Now each of us can take just a small step in the direction of humble service. Why not? Truly Touching, Truly Inspiring. Thank you Nipun and others. I hope this song honors this great man! It is from the center of my heart. It has inspired me to be born again. I hope you guys enjoy. Nipun bhai, I have read and re-read this story, it has moved me so much. It is heartening to know that such Karma-yogis lived in this age. Can Only B Felt! May the Good Lord bless his soul. It's such a touching story. More touchng that it's a real story. It moved me to tears to feel the selflessness of this great man. it is because of peole like Iswar kaka Indians can walk with their heads high. Its because of beings like Iswar Kaka that all of us can walk a little higher. We all get to take from him the guidance he offers and live to a higher personal standard. In open gratitude. I am deeply touched by reading this story of Ishwarkaka. When we want to work for humanity no work is small. The world is a place worth living because of such great Souls. He rightly told his Son to do small good acts in a big way. Koti Koti Pranam to such noble Son Of India. PV Shirgaonkar,28 July 2011. Thank you Ishwar Patel. I forgive myself for judging myself as less than you. Thank you. I am moved and inspired by this loving teacher. Hats Off to Mr.Ishwar Patel & family. May his soul rest in peace. Heaven welcomed a beautiful angel home and the world wept for the loss of Ishwar kaka.. God bless this beautiful man and may his spirit rest in peace.. It is not celebrity on media who can touch your hearts and influence the way you think, it is the work like this of unsung heroes which can bring about tangible change. Humbled and inspired. Thank you. Thank you so much for sharing this article. I felt I wanted to know him and felt a great loss of a great life. Grateful to know such souls exist. Thanks for opportunity to know him even through words. Great website! It is by wonderful serendipity that I came across your article on Ishwar Kakaji...13 months after his passing and from a different dimension he reaches out. He still works quietly; uplifting, energizing and shifting peoples minds and hearts as seen by reading all the commments made by people all over the world.What a love story...loving the unlovables, serving the untouchables and with his last breath lovingly leaving his wife with Jai-Jala!I am blessed to happen upon your inspirational article and grateful to all who added videos of him showing him multi dimensionally. I had some decisions to make and the advice he gave his son was was what I needed to be reminded... follow the inner voice no matter what. Thank you God for bringing me to this page, thanks Nipun for your evocative article and blessings to Yasuda kakiji, the family and all who miss his compassionate and exemplary life. "Karmayogi" of highest order. Reflecting on myslf, feel so small in my own eyes. Inspirational indeed for all of us. Truly inspiring to read about IshwarKakaji. The beautiful words you wrote about kakaji moved me. I can now only imagine meeting this great soul would have been so profound and heartening. I guess all of you who have met him, known him and learn't from him are lucky. Thank you Nipun...no words...just the tears in my eyes. What an inspiration! We all can do some type of small acts of kindness. Look at the blessings so many receive when we pay it forward (we do something nice for someone without expecting any compensation; the receiver in turn does something nice for someone else, and so on). What a beautiful soul to help people think differently about caste and tradition... especially in a country such as India where this has been such a centuries old practice. Having lived some time myself in India I have only praise and admiration for a man I not only had never met but never even heard of...after reading this post it doesn't surprise me at all that 10,000 people came to his funeral. Nipun g thanks for sharing this. Moved beyond words.hv touch my heart..hat's off 2 lovely person..RIP..
NIPUN AMAZES ME. TO ME HE IS A LIVING EMBODIMENT OF KINDNESS AND SELFLESSNESS. MAY GOD BLESS HIM SO THAT HE CAN SERVE FOR A LONG LONG TIME. THIS WORLD CAN TAKE ALL THE ACTS OF KINDNESS THAT HE CAN GIVE. Although Born in Valsad Gujarat, I did not learn anything more about Gandhi than what was brainwashed into me by schools. The real light of Gandhi came to me through Narankaka in his Gandhikatha, which i helped organized. Ishwarkaka came in my life during a vist to Gandhi Ashram for some continuity of Gandhikatha event, in December 2009. We had some discussion on My Voice is my Life. Later he asked me to join him with a cup of tea with such a love that I enjoyed whole heartily because it came with his company. I could see love flowing out of his eyes, speech and acts. I see similar trend in Nipun Mehta in continuing legacy of our former Gandhian followers through his deeds. Keep up the good work; You are our Gandhi of the current Generation, in my heart. I have met Jayesh Bhai very recently and did not have the privilege of meeting his father. But Jayesh bhai has the inner strength and love and compassion for all...It shines through in his interactions with one and all..His father's legacy is continuing through Jayesh Bhai. ... made of something else.. I had opportunity to be in his company for last 20 years. He was always focused and committed to the cause for which he lived for his life time. He made a most difficult work so simple. He remained a simple man and never lost hope. A great soul who touched the life of a most deprived community. You could visualize through him the pain of these untouchables for whom he did work to give dignity through a professional approach. Having visited ESI Sughad recently, and having got the opportunity to be blessed by Jayesh Bhai, this post has managed to shift something inside my heart in a very subtle, but a powerful way. Thank you, Nipun, for sharing the story of this timeless man. So much to learn! He showed. Service is salvation. It fulfills the soul. Raises one to nirvana. Hope we can learn. God bless his soul and give us wisdom to follow. A deep bow to Ishwar Kaka and Jayesh Bhai, whom I was fortunate to meet and spend a couple of deeply heart inspiring hours in Feb 2019 at Sughad in Ahmedabad. Any one cause of public service in the celebration of life is as big as supporting the entire universe itself. It is in the small acts one learns meaning, purpose and even perfection perhaps. I love all the design principles and the process with which all projects emerge and get executed. ServiceSpace is a social service innovation par excellence.